When you sign up for Pokemon Go with a Google account, Niantic and partners acquire full access to your entire Google account. “When you grant full account access, the application can see and modify nearly all information in your Google Account (but it can’t change your password, delete your account, or pay with Google Wallet on your behalf). Certain Google applications may be listed under full account access. For example, you might see that the Google Maps application you downloaded for your iPhone has full account access. This “Full account access” privilege should only be granted to applications you fully trust, and which are installed on your personal computer, phone, or tablet. 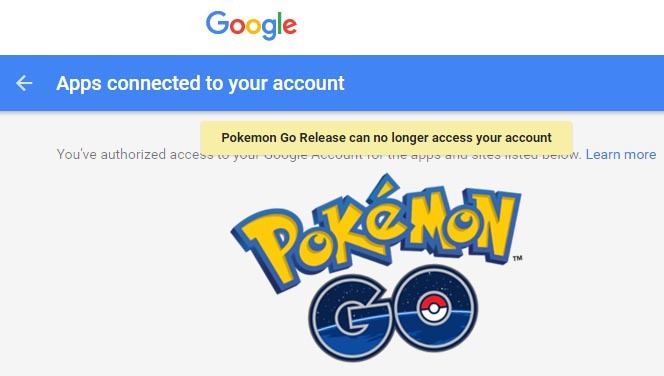 Remember, every-time you login to the game on a Google account, it reacquires full access.